Kürzlich renoviertes Apartment mit 1 Schlafzimmer und privater Terrasse. Dieses liegt in einer ruhigen Straße im ehemals jüdischen Stadtviertel von Santa Cruz. Das helle Wohnzimmer verfügt über ein sofa, einen Couchtisch und Eßtisch mit 2 Stühlen. Die Küche, welche sich im Wohnzimmer befindet, verfügt über eine Theke mit Barhockern sowie über alle wichtigen Utensilien und Küchengeräte. Weitere Ausstattungsmerkmale: Flachbild-TV, Klimaanlage (warm / kalt) und kostenloses Internet. Ein Flur führt in das Schlafzimmer mit einem Doppelbett, einem Schreibtisch und einem großen Kleiderschrank. Bad mit Badewanne. 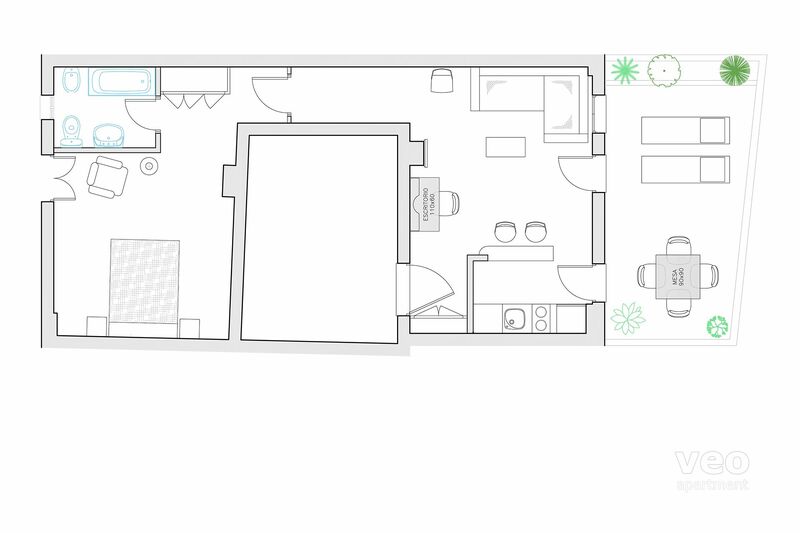 Das Schlafzimmer öffnet auf einen Innenhof und bietet somit einen ruhigen Platz zum Schlafen. Eine Glastür führt vom Wohnzimmer auf die Terrasse. Diese ist mit Pflanzen und Stühlen ausgestattet. Ein Teil der Terrasse liegt im Schatten, perfekt für heiße Sommertage. Man kann von dort aus auf Teile der Kathedrale blicken. Santa Cruz, im Mittelalter das jüdische Viertel der Stadt, ist eines der reizvollsten und farbenfrohsten Viertel Sevillas. Die Königsresidenz der Reales Alcázares und die Kathedrale sind von hier aus bequem und schnell zu erreichen. Ein Spaziergang durch das Labyrinth der engen, gewundenen Gässchen und Plätze dieser malerischen Gegend ist wie eine Reise in eine andere Zeit. Tausende von Orangenbäumen, die die Gässchen schmücken, verbreiten im Frühling einen bezaubernden Duft. Wandeln Sie zwischen den gekalkten Häusern mit Einblicken in versteckte Innenhöfe, geschützt vor der heißen andalusischen Sonne und entdecken Sie eine breite Auswahl ausgezeichneter Tapasbars und Restaurants. Cleaning: Change of towels and bed linen included once per week. Babybett: 25 EUR. Bitte im Buchungsformular angeben. You are in the middle of the most picturesque streets of Sevilla! You are going to get lost, but you do not mind! The terrace is nice to be on, with comfortable beds and chairs. In march you will have the sun on the terrace around 14:00 (pm) till 19:00. You have to move your bed around to get the sun. Supermarkets are a 7 minutes walk (Plaza Alfalfa), bars and restaurants on your doorstep. We recommend "El Pasaje" as best quality in your neighborhood. The bedroom is situated inside the building, so you don't hear any streetnoises or churchbells too loud. Ofcourse, they are there, but not to loose sleep over. "Pure Dead Brilliant apartment in Santa Cruz"
My Wife and I chose this location hoping to experience the ambience of Seville and Santa cruz in particular. We were not disappointed. The flat is as described, the terrace is great and the street below is always fascinating to look down on. We walked to all the main attractions in only a few minutes. The nearest supermarket is only 7 minutes via narrow twisting streets [an experience to be enjoyed]. Communication with Veoapartment was 1st class, apartment as described. We came later this year due to a medical issue normally we are a month earlier, however the sun shone for us and as we did our sightseeing in past years we spent the week soaking up the Seville atmosphere and indulging our passion for Tapas. The whole break was just perfect. 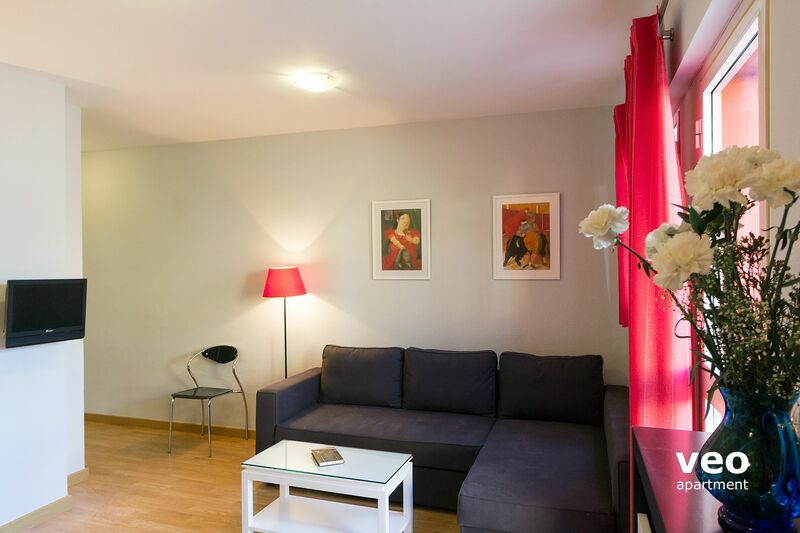 Appartement tout confort, conforme aux photos. Location idéale dans le quartier de Santa Cruz, mais calme. Accueil sympathique avec de bons conseils. Centrally located, spacious, clean and comfortable. Nice Terrace with good views. Really enjoyed our stay here, the balcony was superb. Would be useful to have 2 sets of keys for 2 people and the hot water was a bit hit and miss but I'm sure those issues will be addressed. I'd definitely stay here again. "Amazing apartment in a perfect location"
Had a wonderful time in the Santa Cruz apartment. Everyone was so welcoming and accommodating. The terrace is spectacular and a perfect place to rest, relax and siesta while sipping on sangria and watching life pass you by. Lovely apartment, great location. Delicious tapas just around the corner! Hemos estado encantados con la estancia en el apartamento, estaba todo muy limpio, las toallas y las sábanas olían a recién lavadas, los utensilios de cocina brillantes, además si necesitábamos algo en la calle de abajo hay un pequeño supermercado, quizá la única pega que pondría es la escasa luz, habría que cambiar las bombillas a más vatios, por lo demás MUY BIEN!! Appartement très agréable, au 2e et dernier étage d'un immeuble propre et tranquille au sein du "barrio" de Santa Cruz. Seul sur le palier. Accueil efficace, à l'heure. Un petit bémol, le lit mériterait d'être un peu plus large. 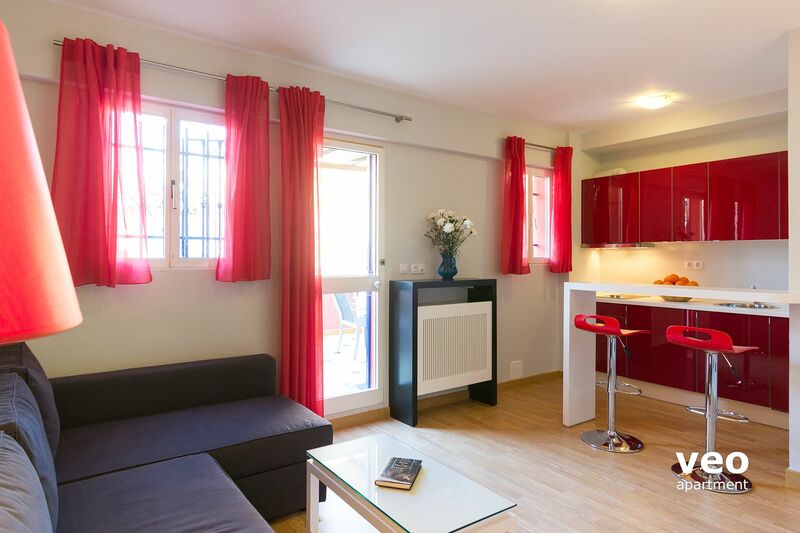 "Lovely and quiet apartment, close to all the interesting sites to visit." Nicely decorated, lovely terrace, good bed. The shower could be better though, and cloths for drying the dishes would have been practical, but we had a great time. Although it's in the heart of the old town, it's very quiet, and everything is within walking distance. 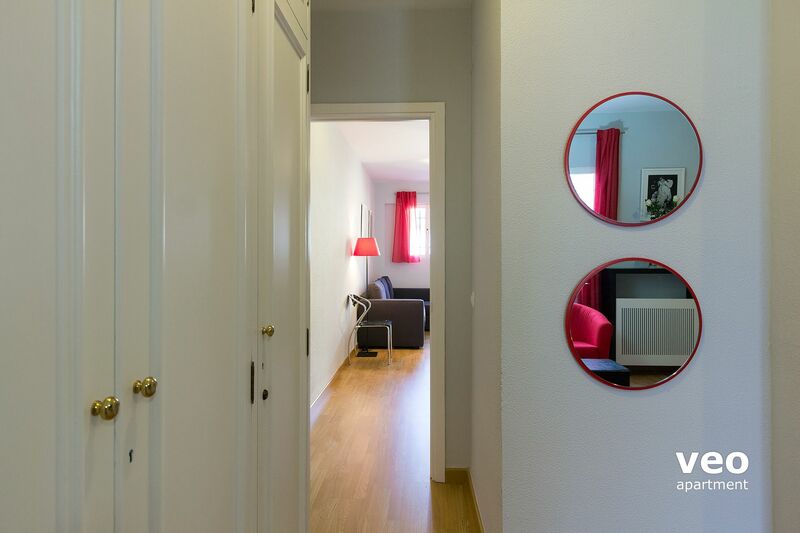 The description and photos give a good and realistic idea of the apartment, reservation was fast and smooth. l appartement était tel qu il était présenté sur la video ! et la relation avec carolina qui nous accueilli impeccable ! juste un détail peut être ajouter dans la salle de bains une tablette pour rangement des affaires de toilette ! Une bonne adresse au coeur du quartier de Santa Cruz, tout confort à proximité des différents sites sympas de la ville. Très bon accueil. A recommander. My husband and I were so pleased with our stay at the Santa Cruz Terrace apartment. The apartment was clean, with great modern touches, a lovely patio and was in a convenient location. Bel appartement récemment rénové similaire aux photos. Très bien situé au coeur de Santa Cruz, à deux pas de la cathédrale! Plein de restos sympas dans les environs. Les visites peuvent se faire à pied. Bref Séville est une ville magnifique. 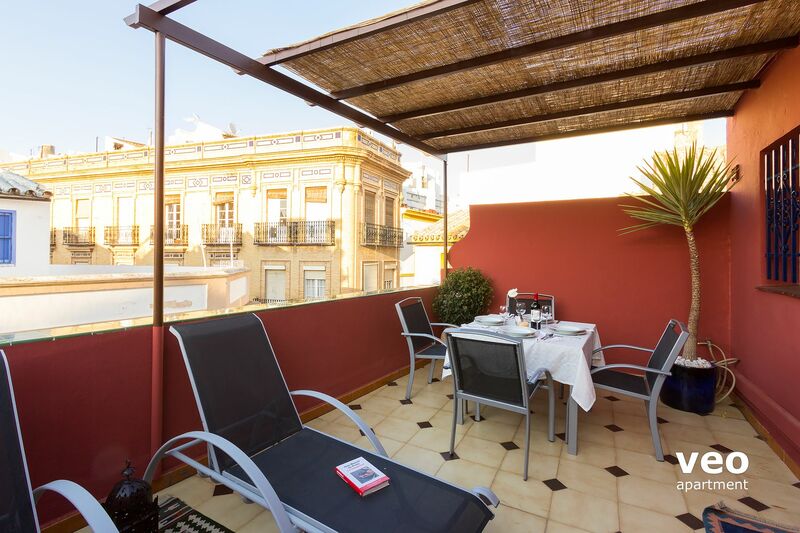 "The Perfect Location for a Gorgeous City"
"Perfectly located and great value"
A great apartment right in the heart of old town Seville. Could not ask for a better location. Facilities in the apt were perfect for a five night stay - afterall, we were there to enjoy exploring the city and wanted somewhere to stay where we did not pay for things we would never use. The apt met those requirements exactly, as far as I am concerned. Would not hesitate in recommending or rebooking again. Thank you. Appartement bien situé au centre du vieux quartier. Terrasse agréable mais rue bruyante. L'hiver le soleil ne donne qu'en fin d'après midi. Équipement de l'appartement un peu léger (pas de cafetière electrique par exemple). Adapté pour 2 personnes. "Bien situado y bastante agradable"
Las bombillas de las mesillas de noche deberían tener más potencia. En el apartamento hace un poco de frío. Loved my stay at the Santa Cruz Terrace apartment. It was well designed, quiet and well located. The terrace was wonderful and it was warm enough in November to use it during the day. I would love to stay there again. "A great apartment. Well situated for everything. Easy to walk anywhere in the city." We were very impressed by Veoapartment. My emails were all answered immediately. Even on a Sunday! The team were really efficient. This was good, as we have not used this company before. We also used the pick up service. Jesus was there waiting for us at the airport, and was extremely polite, helpful and pleasant. We asked him to take us back when we returned. We were very happy with the apartment. Its situated in a nice and quiet building. 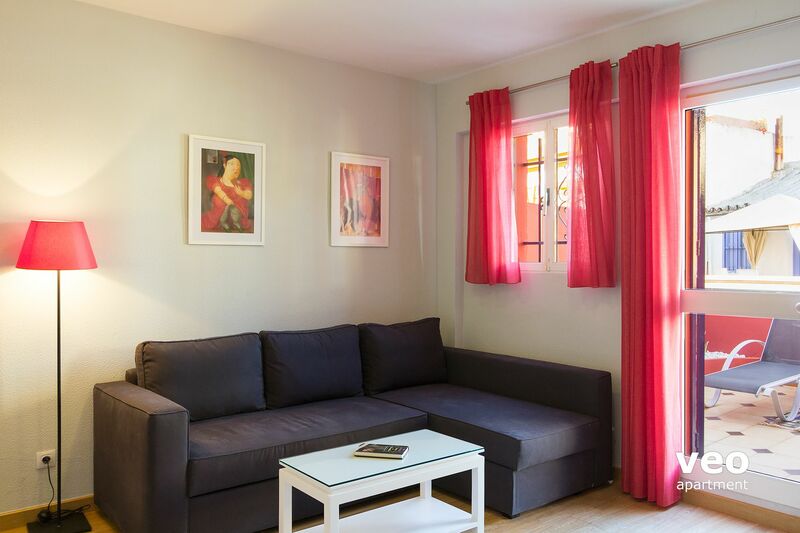 The apartment itself is very nice and clean and well equiped, specious, big and lovely terrace and a comfy bed! The location is excellent. Also, the parking at the Arenal parking garage (10 euros a day, 10 min walk) was perfect. Would definitely stay here again. Perfect location. 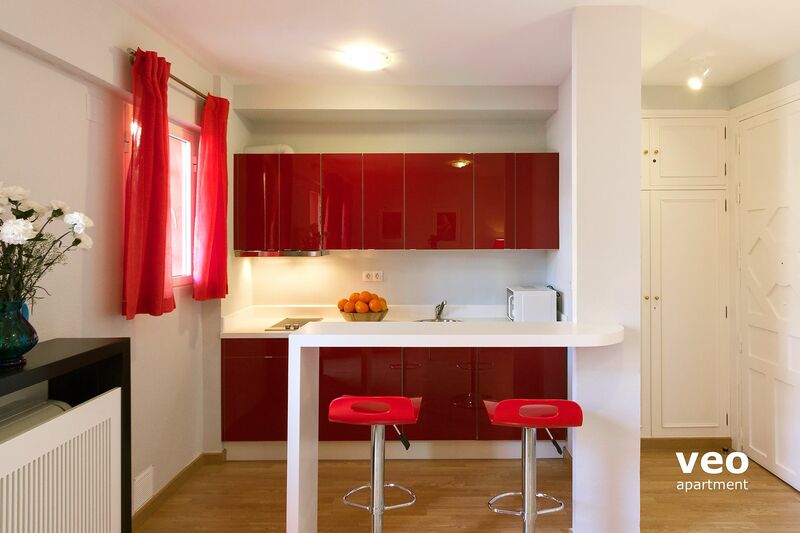 Fantastic apartment, very modern and spacious and beautiful terrace. Well appointed kitchen. Would definately stay there again. 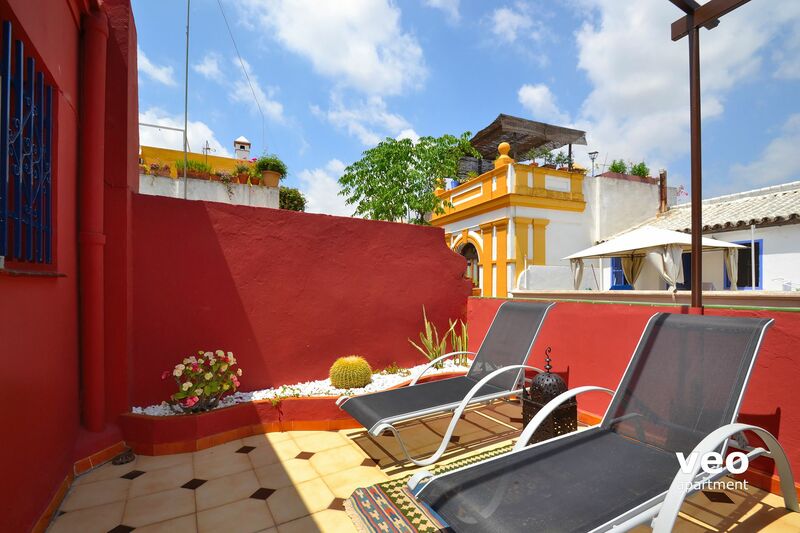 "Lovely appartement, complete and on a perfect location in Santa Cruz." We had a great time in this appartement. We are two sister and for us it had been beter to have two single beds in stead of a double bed. Everything we needed was there so we had a great time. "Great location, comfortable apartment - all mod cons." Great apartment. Thoroughly enjoyed it. Nicely set out, spacious, decor in good order. Really comfortable bed. We had a thoroughly relaxing 2 weeks even though the weather wasn't brilliant. The terrace is the apartment's best bit. Just a few suggestions. As we were there for 2 weeks we did cook in - we could have done with a bread knife and vegetable knife, also a draining board for dishes and a few small bowls. From a personal perspective, I think a small dining table is of more value to visitors than a desk. The breakfast bar was great for breakfast, but hard to eat a meal at. The shower too could have been a little more powerful. Water was always hot, but the flow of water was quite poor. One important point is that the bathroom is in effect an ensuite. So if others are sharing the apartment with you ie another couple, you would need to know them well! They need to come through the bedroom to access the bathroom. 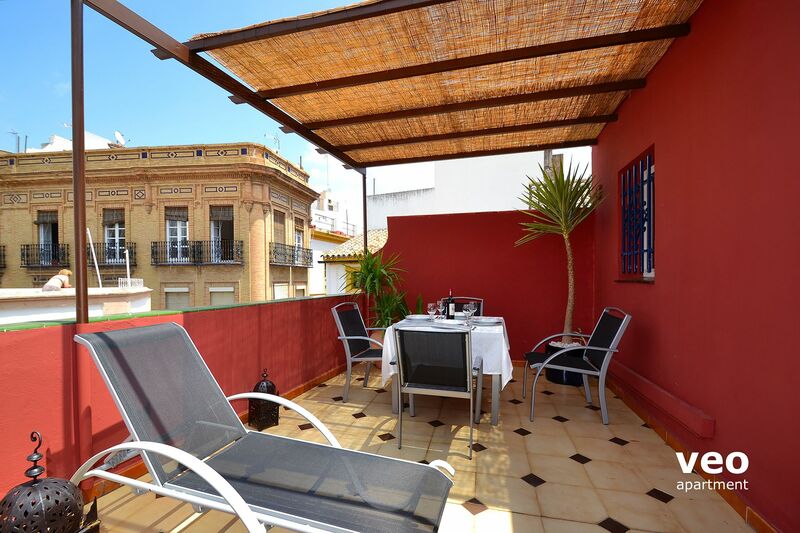 "Super location - great sleep"
Super location in Barrion Santa Cruz, just a few steps to the Catedral and surrounded by good, friendly tapas bars; including the "best bar in Sevilla". With a very comfortable bed and some wonderful peace and quiet this is a good place to stay. It even has the best alarm clock in the world - the bells of the Catedral at 9am - nicely muffled. This is a third floor apartment and was chill, whilst in was February the hot air heating was barely adequate; not a problem across the rest of the year no doubt. We were warmly welcomed by the manager. Our tips for improvement would be to colour code the four keys - more useful in dim light. All in all a terrific location and comfortable, roomy enough for two but would be very tight for four adults. central position in the characteristic district of the historical center, just a few steps from the Cathedral and Giralda tower. 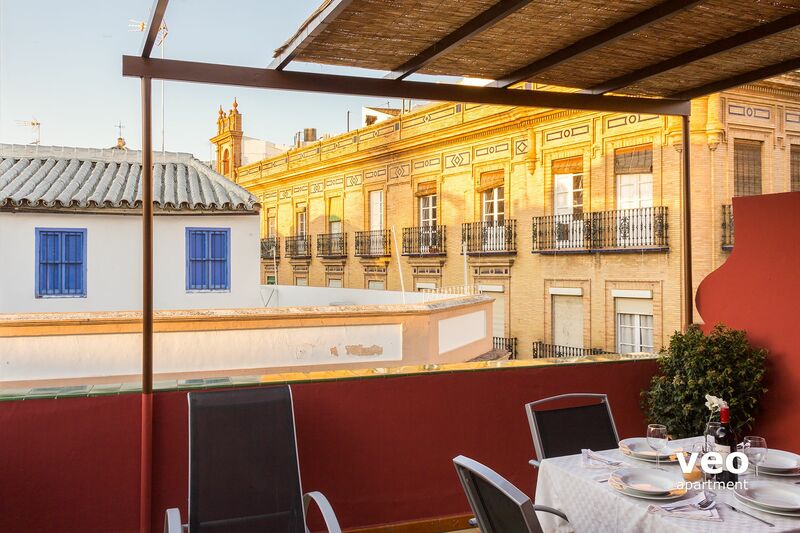 a panoramic terrace with the best view of Seville. orientation to the north probably makes the apartment cool and pleasant in the summer stagiorne, but we were in November and was very wet, the sun never came to the terrace. overall a nice apartment and equipped with the bare essentials. "Perfect location, clean, modern and comfortable apartment, fabulous terrace with terrific views!!" We absolutely loved the Santa Cruz Terrace apartment! We extended our stay an extra night because we just loved the location, the view and how we felt so at home here. It's a bit hard to find, but the great people that worked in the shops in the area helped us out, someone even helped me with my suitcase! Would definitely go back! 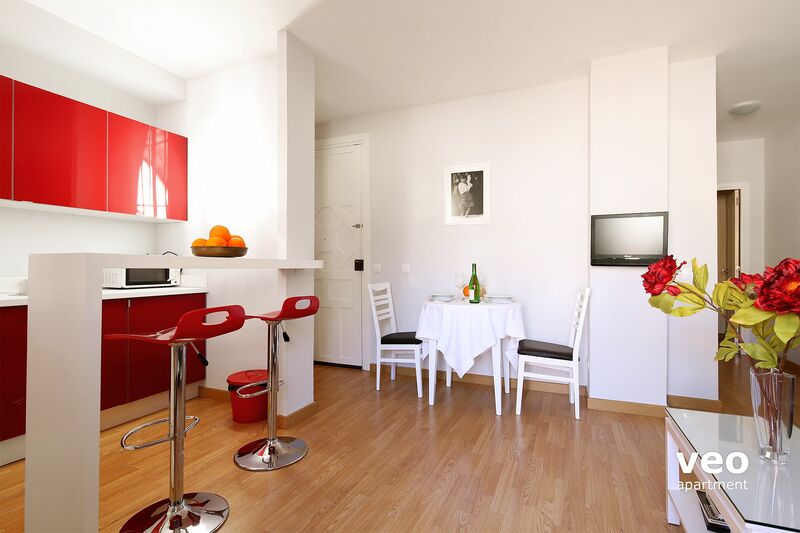 "Great location, great terrace, great apartment"
The apartment was in a very good location, literally round the corner from the Cathedral, and within 100 metres of great tapas bars and restaurants. 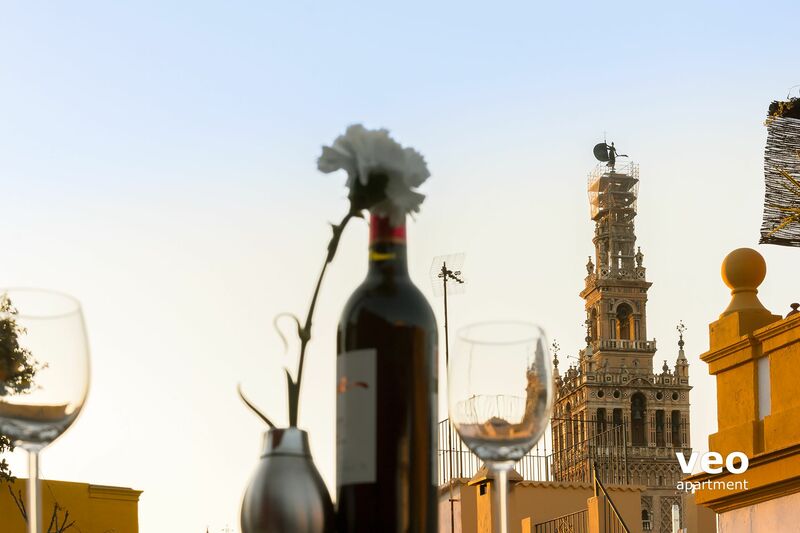 The terrace was very nice, with a fantastic view of the Giralda, spectacular at night. The apartment was quite spacious and comfortable. I would stay here again and recommend it. The unit was excellent. Located only 2 short blocks from the Cathedral square and in the fascinating section of Santa Cruz. The unit was supplied with all the necessities for a comfortable stay. The agent was easily contacted and prompt in returning our calls. She was waiting at the unit when we arrived and gave us clear advice on how to use all the facilities. The location in the tiny alleys of the old town with cafes and shops was exciting. The terrace really made the unit special and so Spanish! Airconditioning was great in the summer heat of Seville. We really felt we had been absorbed into the vibrant life of Seville in that location and have no hesitation in recommending it to anyone. A safe is alway good for piece of mind and this is the only suggestion I would have. Although the building has no lift the stairs were easy. Thank you Veoappartment for a very special experience. 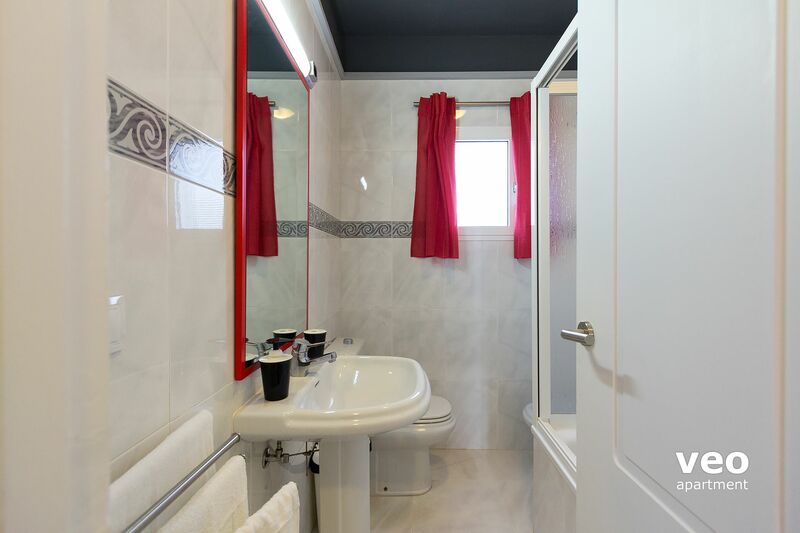 "It is a perfect location; close to all of the important Seville attactions and sites." Clean, spacious and well appointed. And very economical. I would stay there again and recommend it to others. 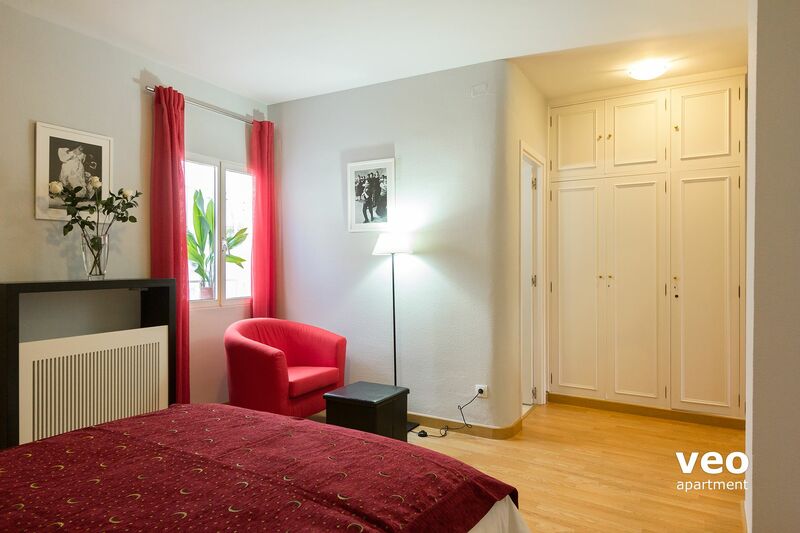 Located within walking distance of main attractions like the cathedral and alcazar ( 3 minutes). Restaurants and shops outside your door. Wonderful terrace for relaxing at night with a glass of wine. It is not accessible by taxi. You do have to walk your bags up a couple of streets although not too far and it is located on the 3rd floor so you have to carry bags up a couple of flights. veoapartment's reply: Thanks for your comments. The street (Pasaje Vila) just before the apartment street (calle Jamerdana) is accessible by taxi. The apartment is right at the beginning of Jamerdana street. Easy walk to Giralda. Fun to walk through Santa Cruz. "Ideal apartment in a great location!" The Santa Cruz apartment was perfect for my friend & I. We stayed there 6 nights and would have loved to have stayed longer. The location was great - close to the Alcazar, lots of tapas bars nearby, and close to the river when we wanted to get to sights across the way. 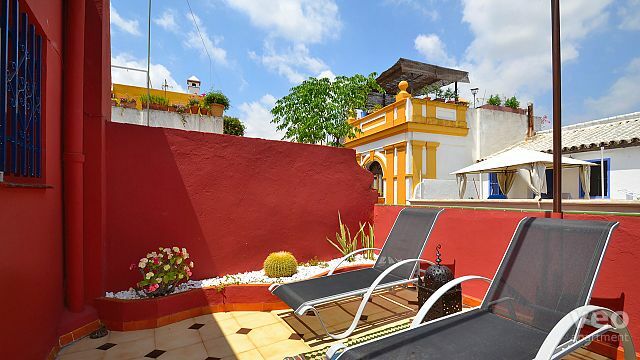 The terrace was probably the main reason we chose the Santa Cruz, and it was a great choice. We loved having a view of the cathedral day and night right from our terrace, and it was a perfect place to watch the neighbourhood wake up as we had our fresh-squeezed orange juice in the a.m,, or wind down in the afternoon for siesta with beers or glasses of manzanilla. Check-in was a breeze and Manuela was already there at the apartment to meet us and suggest some tapas bars. My friend & I had such a great time in Seville and are eager to return. I would definitely stay at the Santa Cruz again. Thanks very much!